VeriCite DocumentationUser GuidesVeriCite Admin Guide ArticlesHow do I view and adjust submission information privacy settings? VeriCite reports limit the information shown in matching student paper submissions to ensure that FERPA and other privacy regulations are strictly enforced. By default, the instructor of the course in which the paper was submitted has access to all of the user and submission details, but other instructors at the institution see only that there is a match and the paper ID of the matching student submission. 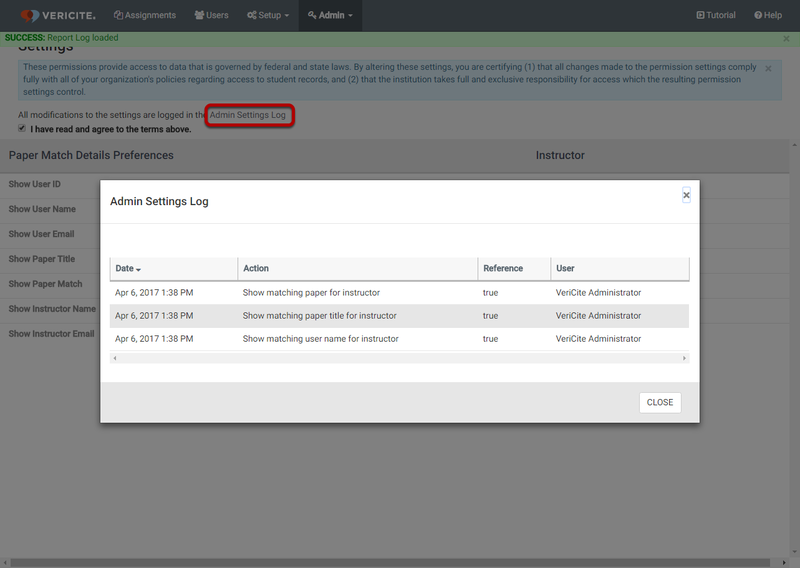 If you wish to modify these settings so that all instructors have access to additional paper details, the VeriCite Admin may do so in the Settings area. Any changes made here are system-wide for your instance. Note: Admin features are accessed through the VeriCite LTI integration. You must be logged in as an admin user in the LMS in order to see the Admin tab in VeriCite. From the Admin tab, select Settings. Zoom: From the Admin tab, select Settings. Check the box next to "I have read and agree to the terms above." Checking this box acknowledges that any changes you make are in compliance with your institution's student records privacy policies. Select the boxes for the details you would like to display. Zoom: Select the boxes for the details you would like to display. Your preferences will be saved automatically once you make your selections. (Optional) Click the Admin Settings Log link to view the history of all changes to the institutional settings. Zoom: (Optional) Click the Admin Settings Log link to view the history of all changes to the institutional settings. Prev: How do I permanently delete a paper from the VeriCite index?